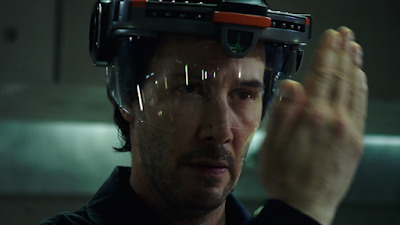 Things are finally looking up for Keanu Reeves' sci-fi film, Replicas. One of the hot buys at TIFF last year, it had a big debut at the New York Comic-Con a few months later. But after a year it had only a couple of teasers (of radically different tones) and no release date. Well, that changes with the brand new trailer, which reveals the film will arrive early in 2019. Directed by Jeffrey Nachmanoff, the film stars Reeves as a man who breaks all of the physical laws of science to replicate his family who has been killed in an accident. He'll stop at nothing, even if it means going up against the authorities, and as it turns out, the wishes of those he has brought back from the dead. Kinda looks like a sci-fi version of Pet Semetary, all it needs is a creepy resurrected cat. Also starring Alice Eve and Thomas Middleditch, Replicas opens January 11th 2019.